Some cars can detect when a driver is falling asleep at the wheel and so too can Google(s goog) Glass. DriveSafe is a new app for Google’s wearable headset that uses the sensors inside Glass to detect if you’re nodding off while driving. Google Glass owners will have to sideload the software directly on to Glass at the moment; it’s not yet available through Google’s MyGlass application. Once loaded, the app is enabled by speaking “OK Glass, keep me awake.” From then on, the app monitors you as you drive around and send both an audible and visual alert to jolt your awareness if it detects you’re falling asleep. The software can then help guide you to the nearest rest stop for a break. Users can turn off the sleep detection function by swiping to a Stop option in DriveSafe. DriveSafe is the brainchild of Jake Steinerman, a frequent long-distance driver, and a small team of three others. Steinerman pointed me to a 2010 AAA report(PDF) that suggests 41 percent of all U.S. drivers admit to have “fallen asleep or nodded off” while driving. Clearly, there’s need for alerting drowsy drivers. Should Glass be part of the solution? That’s a tricky question as some may think that wearing Glass can distract while driving. I can see their point, having worn Glass while behind the wheel myself. And we’ve already seen how some municipalities feel about that: A woman in California got a ticket in October for wearing Glass while driving. This looks like an interesting application. What do you think of the possible unintended consequences of this? Could we find that, in aggregate, this app is actually more dangerous as more people think they can drive “safely” if they are tired, because this will keep them from falling asleep? You activate it by speaking “OK Glass, keep me awake”, so I could see people thinking along those lines. I obviously don’t know if this would happen or not, but it’s a worthwhile question to add to the debate about safety. Good questions of course. I’m not thinking of too much “added” danger here. That’s like saying people consciously drive faster and more reckless if they know they’re wearing a seat belt. 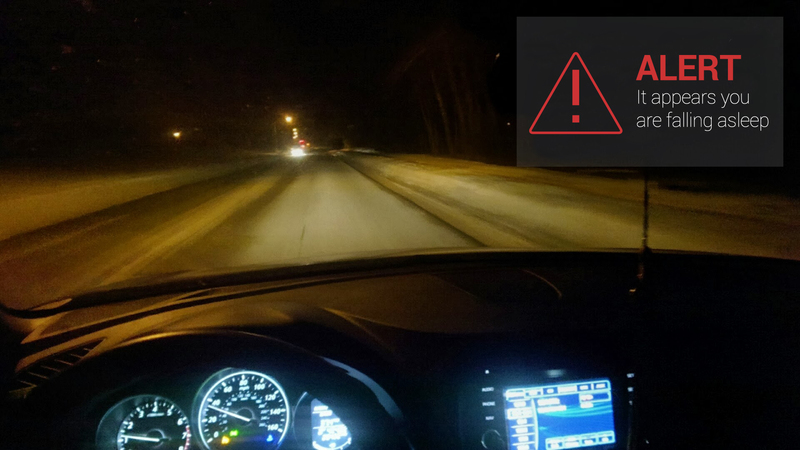 DriveSafe is intended to be an added protection for drivers, but we can’t guarantee drivers won’t fall asleep, especially since the app is only beta software. Like anything, the more safety measures we put in place, the hope is the safer drivers will be.